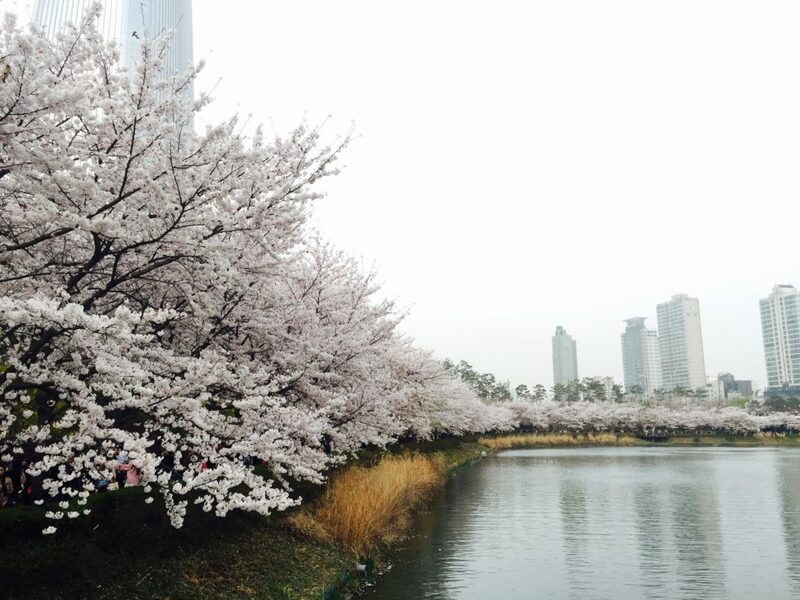 With spring in full bloom in Seoul, the cherry blossoms are one of the most beautiful sights in South Korea! 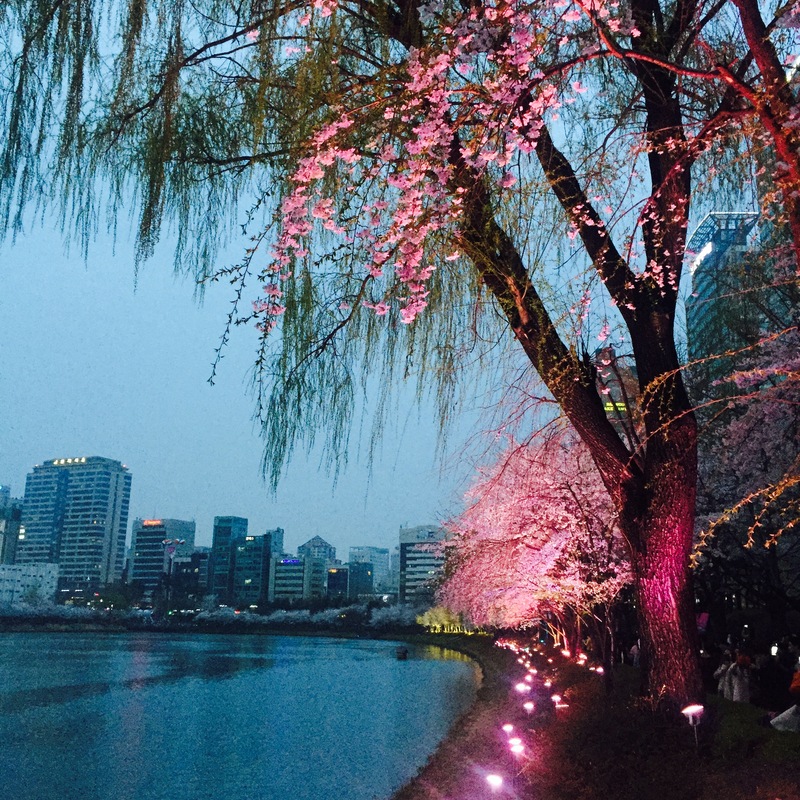 Seokchon Lake is a popular place for Koreans to admire cherry blossom, and there are even more to see this year! 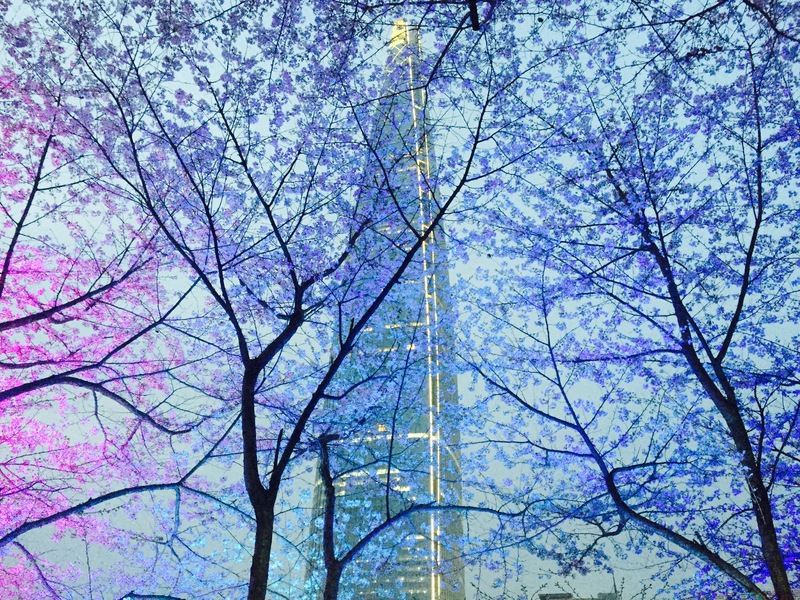 From the gigantic inflated rubber swans floating on the lake to the neon lights of Korea’s highest building Lotte World Tower, Seokchon Lake is definitely the top of our recommendations this spring! Seokchon Lake is a large lake right next to Jamsil Station. 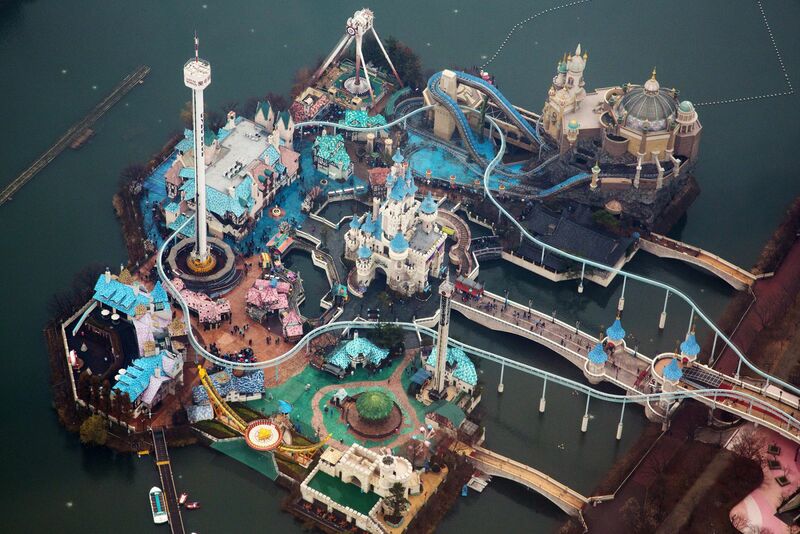 If you have ever been to the Lotte World theme park, their artificial island is in the center of Seokchon Lake! Not only is Seokchon lake a popular destination for the cherry blossoms in the day time, it is also very beautiful at night, with special lightbulbs placed alongside the lake to bring about a beautiful scene! On the other side of the lake afloat huge rubber Swans you can only see in this season. 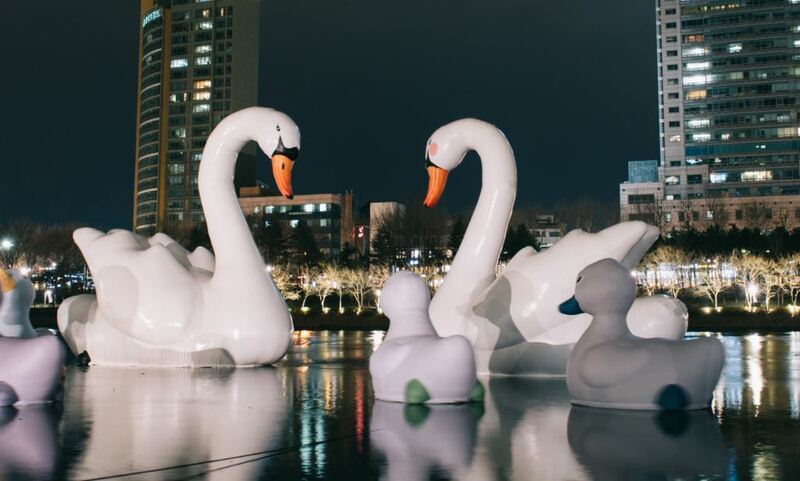 Designed by Dutch artist Florentijn Hofman, who also created the famous Rubber Duck, the “Sweet Swans” will be on exhibition until May 8th, make sure you don’t miss the chance to see them!! Sweet Swans is a art exhibition consisting of two adult swans and baby swans. Created by the same sculptor who made the giant rubber duck that called Seokchon lake home, the baby ducklings are themed with different colored peaks! Pink, green, orange, yellow, blue or black beaks illustrates individuality, and how every individual is unique and perfect. 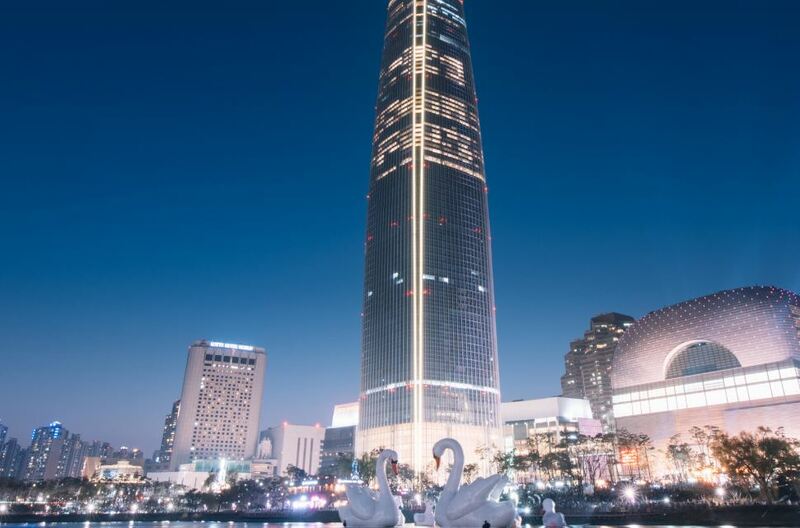 Another reason that the lake is so famous and popular these days is because of the newly opened Lotte World Tower! The tallest skyscraper in OECD and the 5th tallest building in the world, the 123-floor, 554.5-metre Lotte World Tower is right next to Seokchon Lake, Jamsil. It is just stunning to see it from so close with cherry blossom all around! Wait until the sun goes down because the night view is even better! 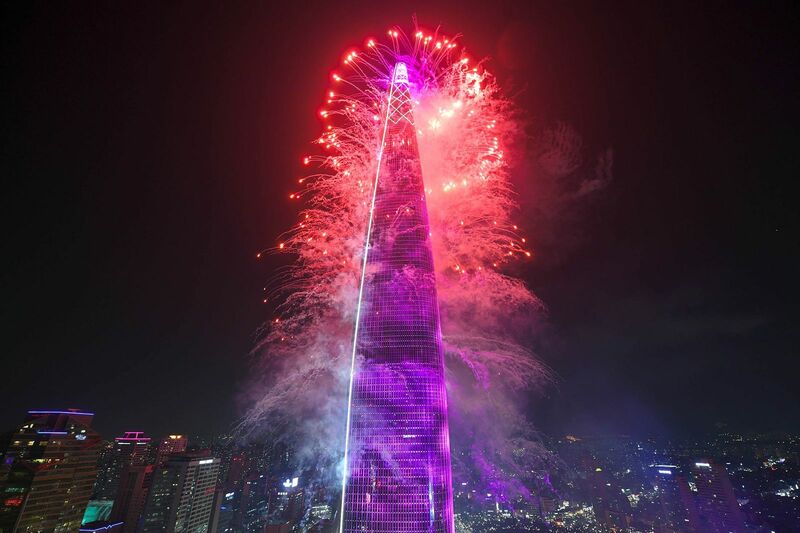 Did you catch the fireworks of Lotte World Tower? It was one of the most spectacular firework exhibitions! 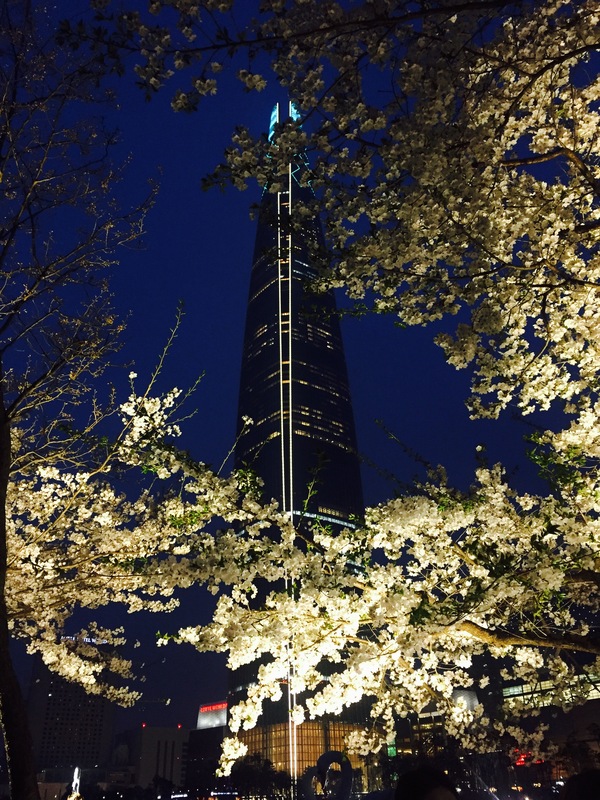 With seven years of planning and 3.6 billion USD in spending, the Lotte World Tower has the world’ highest glass-bottomed observation deck in a building, the world’s highest swimming pool in a building, and the world’s fastest elevator, able to take you 123 stories in one minute. Interested in seeing what the amazing view looks like? 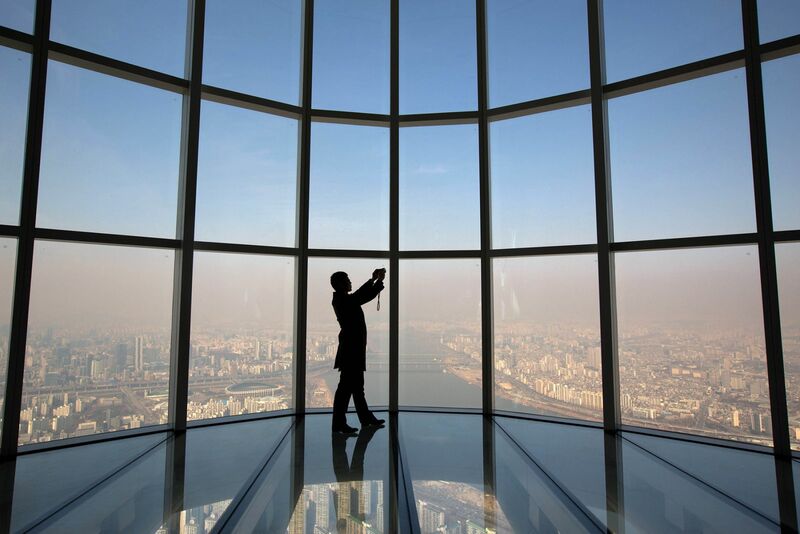 The Seoul Sky Observation Deck is located on the 118th floor! Check out this video and see for yourself! Warning: it can be a bit dizzying! !